SOLON, OHIO – The atmosphere at Solon Tuesday night felt like a playoff atmosphere to many. The fast-paced Solon Comets outlasted the Shaker Heights Red Raiders in front of a nearly sold-out crowd, 90-80, to remain unbeaten at a record of 19-0. The crowd was electric from the opening tip-off. With the playoffs just around the corner, this game felt like a game played in March. Sincerre Carry led all scorers Tuesday night with 28 points. The crafty point guard made some eye-opening plays late in the game that got the crowd off its feet. Trent Williams finished the game with 18 points. These two would pace the Solon offense as five players scored in double figures to defeat Shaker Heights. Mike Bekelja, David Marbury and Nick Close rounded out the scoring with 14, 13 and 10 points respectively. The guard-oriented team is known to play at a pace that many teams can’t keep up with. The stellar three-point shooting served to be the difference maker as Solon outshot the Raiders from behind the arc. Solon would go on to make 12 3-pointers while Shaker only knocked down one all night. Solon hung onto a mere six-point lead after the first quarter. Shaker found themselves down just three points with a little over two minutes left in the first half. From there, Solon would take advantage of the turnovers along with missed shots from Shaker. The Comets would go on a quarter ending 11-2 run to take a 47-35 lead heading into halftime. Christian Guess and his team would not prevail, cutting the deficit to just nine points heading into the final quarter. Solon would use their lead to an advantage late in the final quarter as they would run the offense until they got an easy layup, resulting in precious time ticking away. 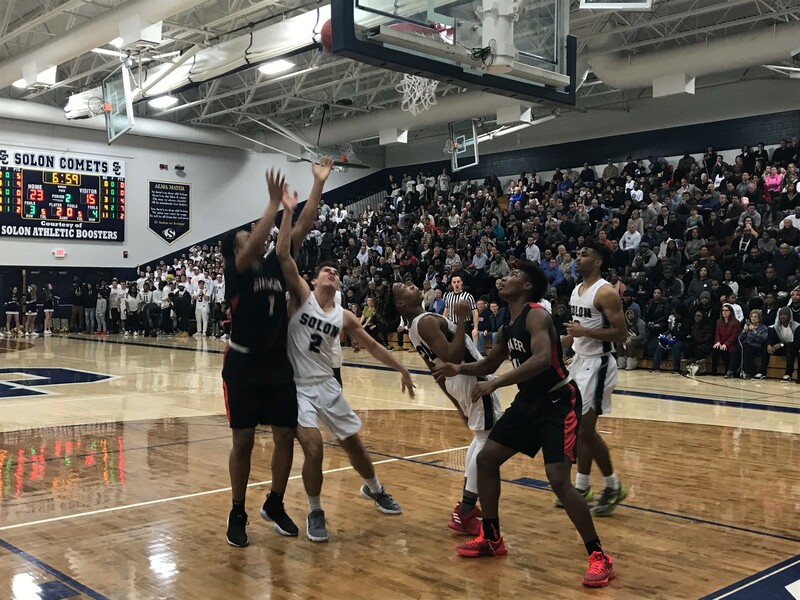 The lead would not get any closer than six points during the fourth quarter and Solon would defeat Shaker Heights for the second time this season. Christian Guess led the Raiders during the loss, pouring in a team-high 26 points. Senior point guard Dale Bonner’s play was conspicuous Tuesday night, getting to the rim all game long on his way to scoring 21 points. Justin Phillips would round out the scoring contributing with nine points. A couple crafty moves from Bonner and Guess got the crowd on its feet, but they were unable to force late game stops to bring the game within reach late in the fourth quarter. Sitting at 19-0 bring a smile to coach DeCesare’s team as he knows his kids deserve to be where they are at right now. Three more games- two games that are played against Brunswick and St. Edwards- are in the way of the Comets until they can focus on making a deep playoff push this year. Coach DeCesare likes were his team is at and the level of basketball they are playing, but know that they still have more work to do in order to make a trip down to Columbus next month.